← Down-skilling staff is part of the privatisation agenda. From March 5-7, an international gathering in solidarity with the Venezuelan people’s right to self-determination and sovereignty was held in Caracas under the banner “We Are All Venezuela.” It brought together some 300 activists from 65 countries with several hundred members of social movements, parliamentarians and others from Venezuela. The event was held concurrently with the 15th Summit of the Bolivarian Alliance for the Peoples of Our America — Peoples’ Trade Agreement, also held in Caracas, and activities commemorating the fifth anniversary of the March 5, 2013 passing of the historic leader of the Bolivarian revolution, Hugo Chávez. We, citizens of different countries, movements and social organizations, political parties, women, youth, workers, creators and intellectuals, peasants and religious people, gathered in Caracas on March 5, 6 and 7, 2018, reaffirm our solidarity and militant support to the Venezuelan people, the Bolivarian Revolution and its peoples’ government, headed by compañero Nicolás Maduro Moros. We strongly repudiate the very serious escalation of aggression against Venezuela’s democracy and sovereignty by the warmongering government of Donald Trump, global corporate powers and the military industrial apparatus of U.S. imperialism, which seek to overthrow the legitimate Government of Venezuela, destroy the project of Bolivarian democracy and seize the resources of the Venezuelan homeland. We repudiate Donald Trump’s threat of a potential military intervention in Venezuela and warn that such statements are not mere charlatanism. The military option against the Bolivarian Revolution is part of the U.S. geopolitical strategy and doctrine for the 21st century. The world must be aware of the fact that a military aggression against Venezuela could cause a crisis of historical dimensions and innumerable and unpredictable human, economic and ecological effects in the region. 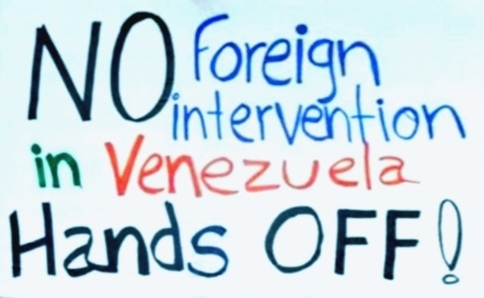 We warn imperialism and the lackey elites who follow its lead: the peoples of Latin America, the Caribbean and the world are never going to allow Venezuela to be touched by the ambition of the U.S. military boot! If based on their insane obsession, Washington’s hawks dare to attack Simón Bolívar’s homeland, it will be, once more as it was 200 years ago, the grave of an empire. We reject the shameful and anti-historical attitude of governments of the region that have prostrated themselves to Washington’s policy, through the creation of illegal and spurious bodies such as the so-called Lima Group. The pitiful regional elites that today lead the looting of their peoples — handing over sovereignty to the transnationals, increasing poverty and inequality and violating human rights — lack any kind of moral and political authority to question Venezuelan democracy. 1. “Events in Venezuela Highlight Significance of Bolivarian Revolution,” TML Weekly, March 17, 2018.